There's ongoing coverage of the ongoing vigorous debate in the UK about 'assisted death.' First is a discussion of the political and legal debate, particularly focusing on the debate about whether family members could be prosecuted for helping loved ones pursue assisted suicide abroad where it is legal (e.g. Switzerland & the assisted suicide deaths of conductor Edward Downes and his wife within the last couple weeks - NYT article here). 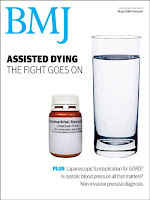 Most interesting though is a commentary written by a physician with metastatic pancreatic cancer (she is supportive of legalizing assisted suicide). I remember feeling that I had failed with a patient who was also a health professional and who was terminally ill with cancer: she had stockpiled various drugs to give her control over her time of death. Unfortunately she had a sudden obstruction of her bowel and could not therefore take the pills when she wanted to. She was therefore furious when she ended up in an excellent hospice where she survived for another 10 days—just what she did not want. She also notes that those leading the national debate about assisted death are politicians and people running hospices who have a 'vested interest' in keeping patients alive (those are not her words but essentially what she's saying). So it's finally come to this: the hospice-industrial complex is denying patients their rights because they're making money (or whatever they do in the UK) off of not hastening death. The editorial is actually well written, and overall a passionate but reasonable plea for patient's rights to do this (as in the anecdote above) and I don't mean to suggest otherwise. But this suggestion that the advocates within the HPM community against legalizing assisted death are doing so because of our 'business model' is a bit ugly. The other paper is a qualitative look at how clinicians explore preferences for place of death with patients. This analysis comes from a study using semi-structured interviews of general practitioners and palliative clinical nurse specialists in the UK that included questions about how they explore/determine with patients place of death. It's an interesting read as a first-pass snap shot of just how ill-defined, fluid, and inadequately assessed these preferences can be. Including how the 'default' assumption that everyone wants to die at home is often not the case, at least when patients become quite ill - the wish to die at home changes to a wish to be cared for safely/not be a burden to family/etc. The most widely reported change was a reversal of the preference for dying at home owing to the patient experiencing distressing symptoms, becoming frightened, feeling vulnerable, or becoming concerned for his or her family. There was also a tendency for patients to replace the previously expressed preference to die at a specific place (for example, home or hospice) with a desire to remain at the place where they were currently being cared for. Most interesting to me was the discussion of how they actually brought up discussing place of death. Not surprisingly a major barrier to this was the simple fact that in order to discuss PoD one had to discuss with patients that they were in fact dying which seemed to be a major barrier in this group of clinicians. One of the aspects of these discussions which was not mentioned is the difficulty that can arise in these discussions due to family guilt. Perhaps this is a cultural difference between the US and UK, or perhaps I'm the only one who finds this to be an occasional issue which has to be confronted delicately with patients/families. 'Dying at home' is generally accepted as a virtue here, and clearly it is something that can be achieved for many patients/families. It can't for many however: family incapable or unwilling to take time off of work, to move in with the patient, emotionally or physically incapable of caring for a dying patient in a home, etc. I've had many situations in which bringing up the question of where a patient wants to die leads to them saying 'home,' which leads to them asking me can they die at home, which leads to me saying that it might be possible but would require among other things an able-bodied adult in the house 24/7 which then gives family members the pleasure of having to tell their loved one some variation of 'we cannot/won't do that' for you (and at times it really is, for whatever reason, 'won't' and not 'can't').